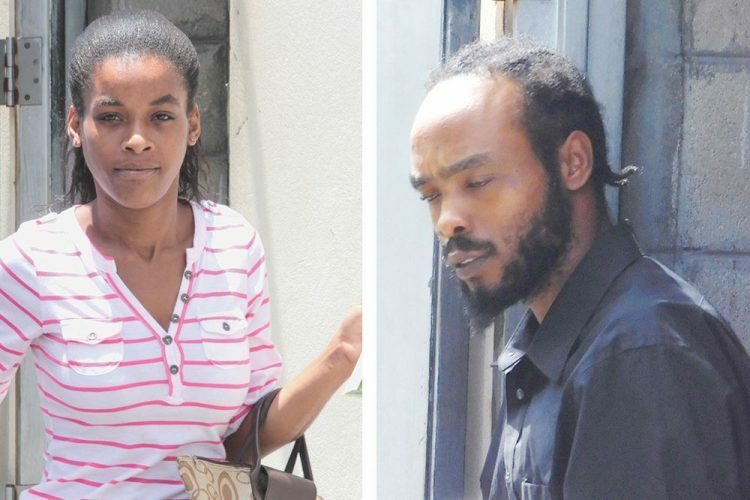 The gun case involving Lowmans Hill couple Randy Shallow and Friekesha Douglas will continue on April 24, 2017, after Chief Magistrate Rechanne Browne-Matthias rejected a no case submission that pointed out some irregularities in the case. The couple is charged that on Wednesday, January 18, 2017, during a raid at their home in Lowmans Leeward, they were found with a submachine gun (SMG), a Glock 40 pistol and a .38 revolver, an AK47 magazine with one round of AK47 ammunition, 14 rounds of Glock 40 ammunition and 45 rounds of 9 mm without a licence. They have been in police custody since their arrest, as no one has signed their bail bonds. On Monday April 3, their attorney Grant Connell pointed out to the Serious Offences Court a number of inconsistencies in the case; however, Senior Prosecutor Adolphus Delpesche maintained that discrepancies and credibility should be left for a jury to decide. Connell argued that the weapons presented to the court had signatures on January 19 that werenât there the previous day when the weapons were presented to the public. He reminded the court that the investigating officer PC 209 Philbert Chambers admitted during cross examination the week before that an exhibit tag was created after he interviewed his clients on January 19. Connell maintained that the tags which are dated and signed January 18, did not exist the following day and that could only be possible if the officers had a time machine. The outspoken attorney further pointed out that of the 13 exhibits before the court, the defence has a problem with seven and the evidence presented is “disturbingâ. He further pointed out the Commissioner of Police said he only put his initials on the firearms and ammunition and did not initial the ski masks that he said were from another raid, yet his initials are on them. According to Connell, there is no such thing as âGlock 9â but there is a â9 mm Glockâ and the gun presented to the court does not have the markings of a Glock. “Where is the Glock?â he questioned. Connell said Sergeant 441 Julian Cain, a well-decorated ballistics expert, the Commissioner of Police, the investigating officer and the officer that interviewed Shallow all say it is a Glock but the gun presented in the interview was not a Glock. Connell claimed that the gun Shallow and Douglas are charged with being in possession of does not exist. He drew the courtâs attention to the evidence of Corporal King, a gazetted firearms expert who said that Glocks are made in Austria but when Chambers read the markings on the gun before the court, it read âMade in Italyâ. Connell asked for an adjournment to seek a firearms expert. However, Delpesche opposed Connellâs submission stating that he jumped across legal theories through his submissions. “The question is, were the exhibits found at the defendantsâ house? The evidence, so far, is yes,â said Delpesche. The Senior Prosecutor said that the exhibits were marked, examined by an expert and proved to be functional. He also noted that the Criminal Procedure Code allows for any part of a charge to be amended before the prosecution closes its case, in relation to the amended serial number for the sub machine gun. Delpesche drew attention to the 15-minute interval in which the defendants did not come to their door when the police knocked and questioned if it was during that time they tried to hide the gun. He maintained that the defendants have a case to answer.